If you’ve ever had a pipe burst because it was frozen, a pesky sink drain that wouldn’t stop leaking or a toilet that wouldn’t stop overflowing, you know that plumbing issues are a huge headache. Not only that, it can be tough to find reputable plumbing services that you know you can count on regardless of the day or time. That’s why we offer 24/7 service for any emergency that may arise. Or maybe it’s your hot water heater going out in the middle of winter, leaving you with less than ideal showers, faucet water and less effective water for your dishwasher. Anything that has to do with hot water heaters, water accumulating, leaking, improper draining – you name it, we’ll make it right again. Plus, we back up our work with a 100% Satisfaction Guarantee. When you consider the amount of pipes running throughout your home, whether it’s plumbing, a hot water heater or heating and cooling related, there’s a lot that goes on between your walls and in-between your floors. In the Haverhill, MA, area, we pride ourselves on being able to provide any number of plumbing and hot water heater services to help make sure your home is dry and comfortable. When you work with the team at Andrew DiPietro’s Climate Zone, we aim to make your experience simple, stress-free and completely satisfactory so that at the end of the day your worries are gone and you’ve got peace of mind that everything is working properly. Our goal is to make sure that all of your plumbing needs are taken care of and that you no longer have to worry about your hot water heater going out, leaking pipes or stubborn drains. 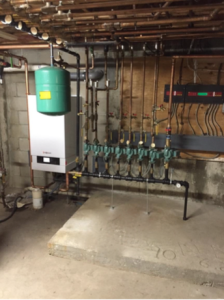 If you’d like to find out more about the array of hot water heater and plumbing services we offer, give Andrew DiPietro’s Climate Zone team a call at 978-872-1190 or set up an appointment online.